Soak dry black beans with cloves of smashed garlic overnight. Boil for about 2 hours, or until tender (canned beans will also work for this recipe). Layer black beans, cheese, and salsa. 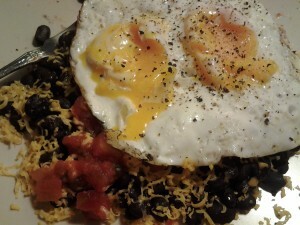 Top with two fried or poached eggs. * This recipe may be doubled. **This meal can also be served as a hearty dinner!